The heavens have certainly been punishing Chicago this week. 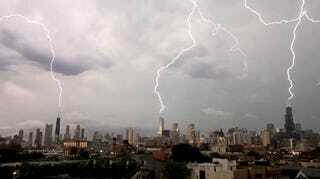 Watch as three mighty bolts of lightning simultaneously attack three of the Windy City's tallest buildings. Clearly, Thor is a Flyers fan. The video is by Craig Shimala, who set his camera up from his balcony. Amazing stuff! [Vimeo.